Started in West Hollywood, California in 2005, this chain boasts being “the original tart frozen yogurt with a clean finish and one-of-a-kind taste that is truly cravable”, as well as providing frozen yogurt to the celebrities such as David and Victoria Beckham, Taylor Swift, and a host of other Hollywood big wigs. Using only non-fat milk, non-fat yogurt and active live cultures, they offer 8 core frozen yogurt flavors, along with a handful of seasonal flavors. They also have a variety of toppings, broken down into 4 categories: fresh fruit, dry, liquid and luxe, the last of which is an additional cost. 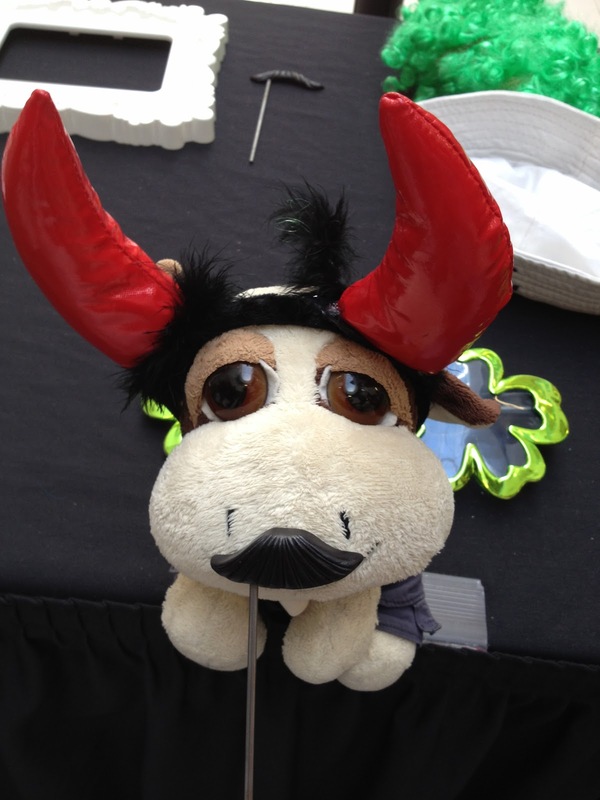 That evening I attended with steadfast companion, @michpetersjones and her little human. 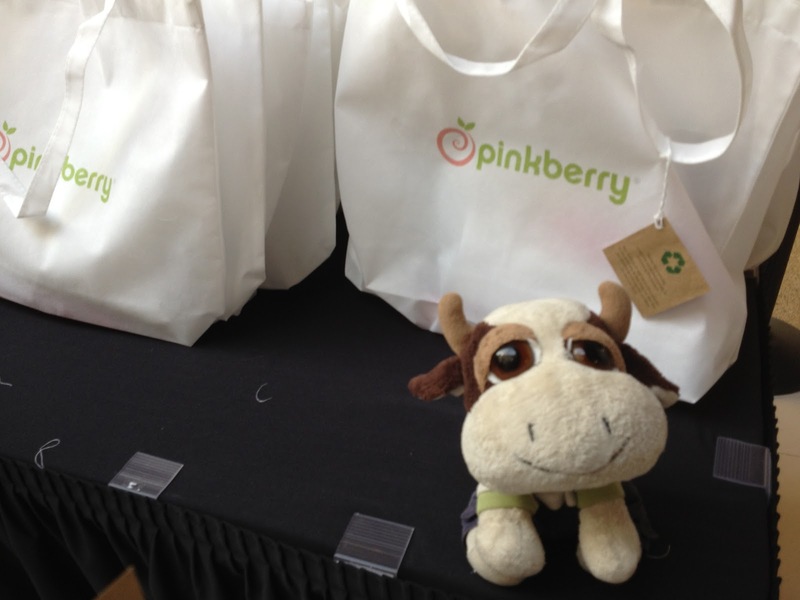 Located in Phase Three of West Edmonton Mall, Pinkberry has a prime location along the main thoroughfare, right at the main entrance to the food court. The space itself is light and bright, with pastel colors adorning the walls. The front counter is chock full of toppings while the back wall is lined with frozen yogurt machines. Behind the counter an army of Pinkberry staff were dressed in uniform, fresh faced, and excited to serve what was sure to be an onslaught of people looking to try Pinkberry for free that evening. Although the VIP and Media preview had originally been slated to start an hour prior to the free customer sampling, they had opted instead to start both at the same time, with the VIP event being held in a roped off area a few feet away from the store. Meanwhile, the customer sampling line up was divided into 2 areas, one line up directly in front of Pinkberry, manned by Pinkberry staff who spent the evening signaling to security guards how many people to let through. The remainder of the line up was guarded by security and located a few feet away, along where the flamingos used to be housed, working it’s way back towards phase three. The line up started well before 5pm and stretched to Orange Julius, and was never ending, although I left around 6:30pm, it likely continued on well after. The VIP area consisted of a photo booth, a table filled with swag bags, and a table set up with bowl after bowl of toppings. Pinkberry employees brought out tray after tray of full sized samples of Pinkberry frozen yogurt in a variety of flavors, allowing us to try as many different flavors, with whatever variety of toppings we wanted. I wound up trying chocolate, original, coconut and strawberry that evening, with chocolate being my favorite. The original had that tart yogurt taste that I don’t particularly enjoy and the texture was a bit on the icy side, but did give me the best canvas for tasting their toppings with. 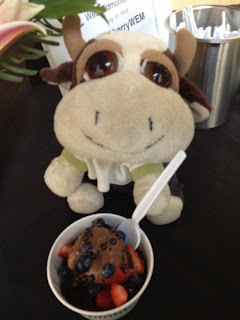 The frozen yogurt wasn’t as creamy as many I had tasted, but it was light and refreshing. Their fresh fruit was cut into perfect bite size pieces, and were juicy and refreshing. The brownie bites and chocolate crisps were had a good chocolate flavor without being overly sweet, and the crisps had a nice crunchy texture. 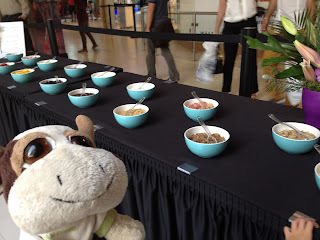 It would have been nice if they had also sampled some of their other offerings such as smoothies, fruit parfaits and fruit bowls which all looked interesting, however they were only sampling the frozen yogurt and toppings that evening. There were unfortunately some hiccups throughout the night, many of which I think had to do with starting the VIP preview and the customer sampling at the same time. Firstly, after talking to some of the Pinkberry staff and asking them what their favorite flavors were, we discovered that none of them had tasted Pinkberry yet. Although they were extremely friendly and enthusiastic, many of them were training for the first time during the chaos of the grand opening. It didn’t bode well with me that they would be hired and expected to serve customers without first trying the product so that they could explain the flavors to others, as well as give recommendations on their favorite frozen yogurt flavors and toppings. Secondly, the VIP’s actually didn’t get their frozen yogurt samples for quite some time, even though customers were receiving their small Pinkberry samples right at 5pm. With only 2 Pinkberry staff serving the VIP preview, I would venture to guess that they were having trouble getting cups filled with frozen yogurt in what must have been insanity behind the counter, to take to the VIP preview. There was a long wait between waves of frozen yogurt samples and were often snapped up quickly by the people standing closest to the VIP entrance. Thirdly, none of the toppings they had out were labeled, so we were often left guessing and asking one another what we thought certain toppings that weren’t easily identifiable were. Fourthly, not all the toppings that were available were available to us in the VIP preview. Having perused their website earlier and seen some of the toppings the customers were getting, it was obvious that they hadn’t included the waffle cookie in the samples for us. There also were not any liquid or lux toppings. 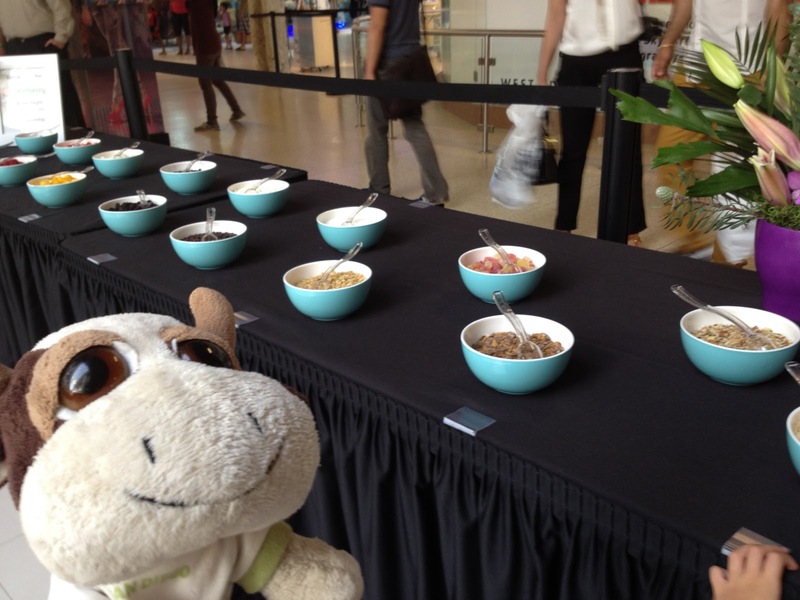 There were only 16 bowls present even though there are 26 fresh fruit and dry toppings listed on their website. 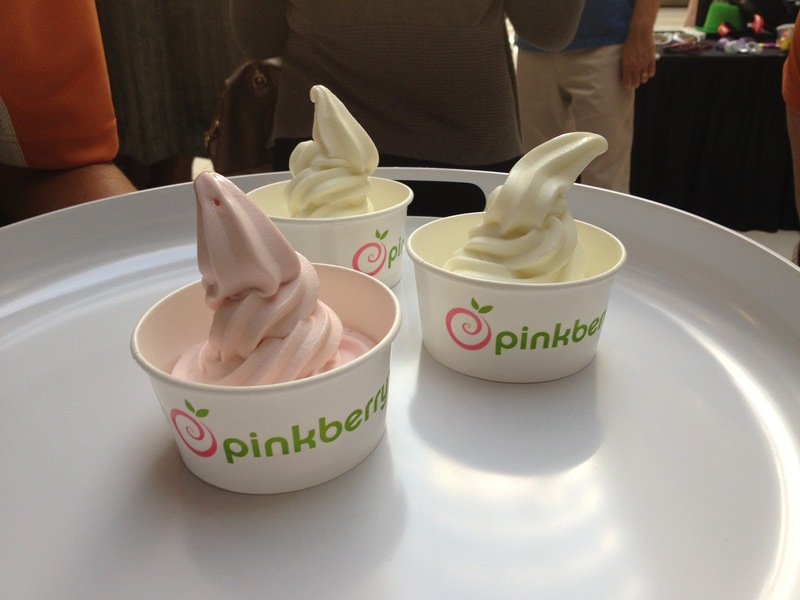 Lastly, the toppings and spoons were not being replenished by Pinkberry staff. The fruit toppings disappeared quickly and were not replenished until the end of the VIP preview. By that time, many people had already left. Not knowing their prices or what their liquid toppings taste like, I won’t definitively say whether or not I like or dislike Pinkberry. 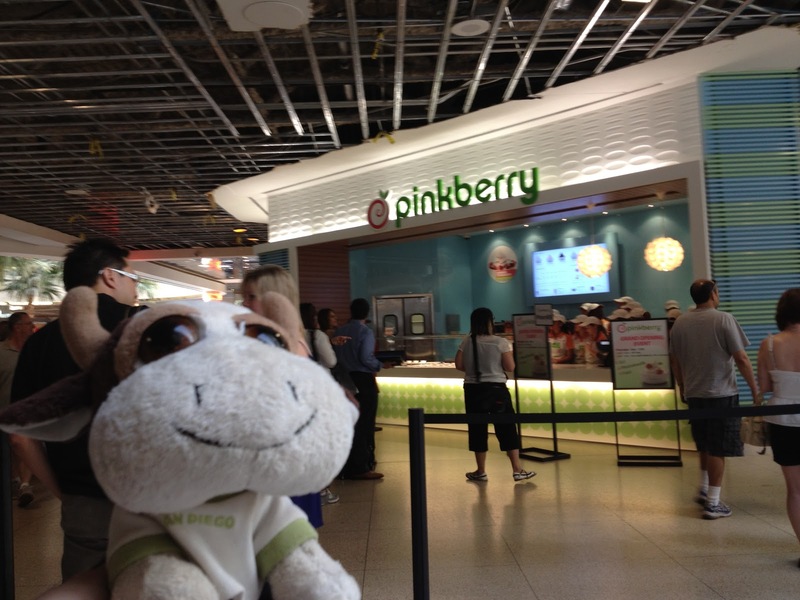 However, considering that I am almost never at West Edmonton Mall, I can’t foresee making a special trip just for Pinkberry. But if I happen to be at the mall, I’d likely swing by to try some of their other flavors and toppings. More photos at The Tiffin Box Facebook Page. I think the whole healthy-yogurt stuff is just a hype. Don't get me wrong, I love yogurt but it tends to just be over-sensationalized much like the "diet-versions" of food and drinks these days. I still believe in the good 'ol balanced diet and a pgx daily supplement. Just saying. I was there when it opened. I really love their yogurt because of the nutrition that I can get from it. I always eat one after I finish jogging.